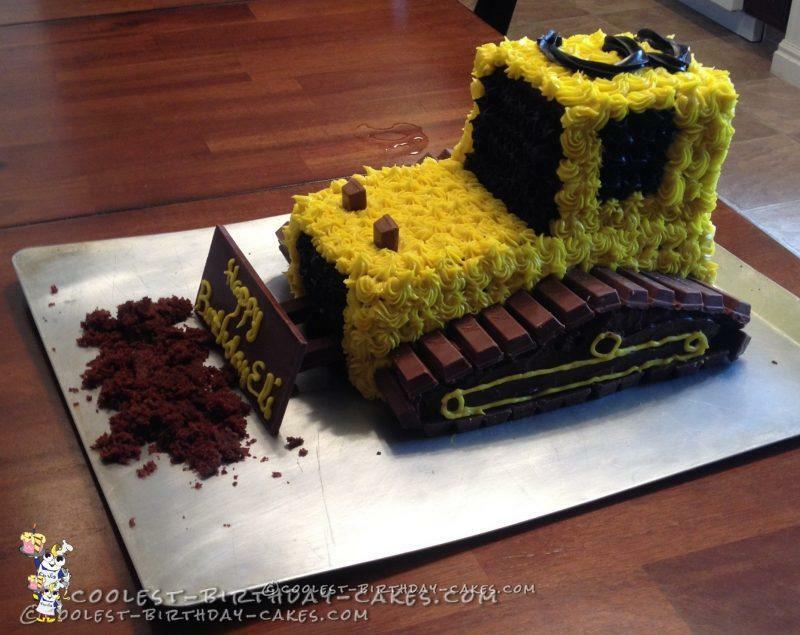 I made this bulldozer cake for my son’s 3rd birthday! I love decorating cakes, and feel that I am fairly good at it. 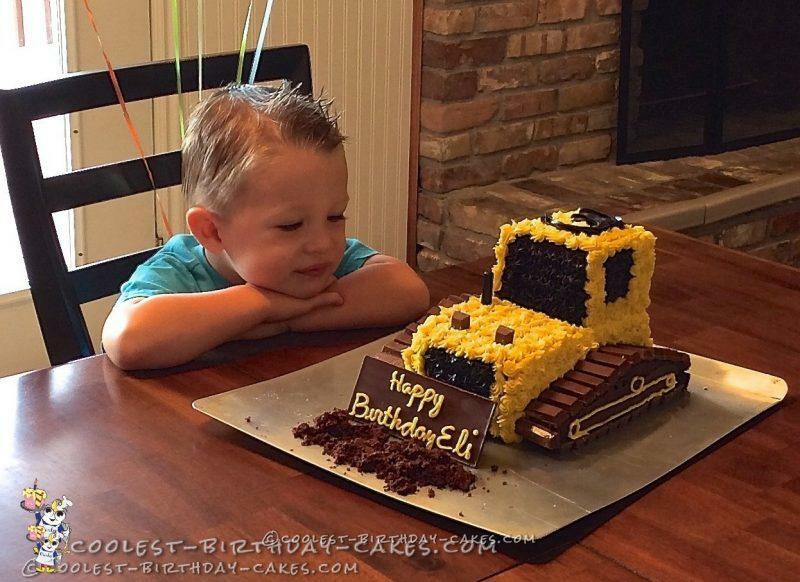 I must admit, though, when my son requested a bulldozer cake, I wasn’t entirely confident that I could pull that one off, especially because I wanted the cake to be 3D. I think 3D birthday cakes are more impressive and cool. After a good amount of time spent on the internet, I found some tips and tutorials and gained some confidence that I could do it. In the end, it wasn’t that difficult, and it was definitely worth the time and effort. To make the cake, you will need two cake mixes. Per each cake, divide the batter evenly between an 8″ loaf and an 8″ square. When done, level all cakes. The body of the bulldozer is made by stacking the two loaf pans together (wider/tops together). Use one of the squares to construct the cab. Basically, you want it to be the same width as the loaf cakes, and about 1/3 the length. You will have excess cake. 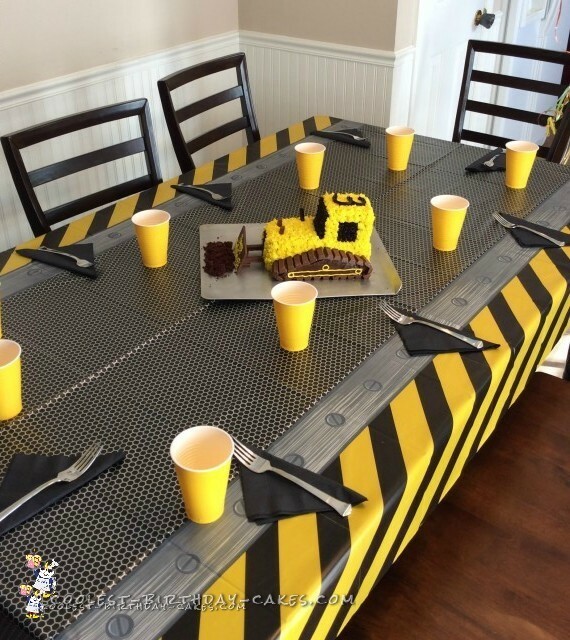 The last square cake is used for the tires/treads. Mini Kit Kat bars are used for the treads, although if you can’t find mini Kit Kat bars, you can always cut regular sized Kit Kat bars down. A Hershey bar is used for the blade. Lastly, crumble up some of the extra cake (if you use chocolate cake) for the dirt and place in front of the blade for extra effect. I can’t think of a better birthday cake for a little 3 year old boy! He was absolutely in heaven. I probably didn’t need to buy him any presents; he was so enamored with his cake and all the guests singing the “birthday song” to him! Your cake is beautifull, I will try to make it and hope I can do as good as you did. Thanks for sharing.